1). I’ve noticed I’ve been missing a couple of questions by you lovely lot, I’ll be going back through comments this evening and answering any that I’ve missed! 2). It seems that my international ladies are finally receiving their Advent Giveaway prizes – wahoo! Hope you like them! 3). I’m going to London Fashion Week, please tell me that it doesn’t matter what I wear right? 4). Not only have I been missing questions, but my emails have been haywire too! My hosting company has switched my account to a new server in the hopes that the problems settle down. Either that, or just to shut me up… If you’ve emailed and I haven’t replied, I probably didn’t get it. Please resend! 5). I’ve got another giveaway coming up, don’t get too excited.. it’s nice but not amazing… however, free stuff is free stuff right? 6). Was there a 6? 7). Oh yeah! My hair mare post… thank you for all your jeering, sniggering and downright bitchiness 😉 I have loved reading your stories and will be re-reading them tonight with Mr. L. Together we’ll pick the worst (or is that best?) and get in touch with the lovely Aussie ladies. If you’ve yet to confess your hair shame… do it now, or forever wear a hat! 8). Leila is poorly, the little mite caught my cold. It’s all my fault, but babies shouldn’t be allowed to catch colds until they’re old enough to know how to blow their noses. My baby-nose-picking finger is getting a work out! She’s doing her ‘monkey face’ but you can see her eyes are a bit watery. Can I get an “awwww”? 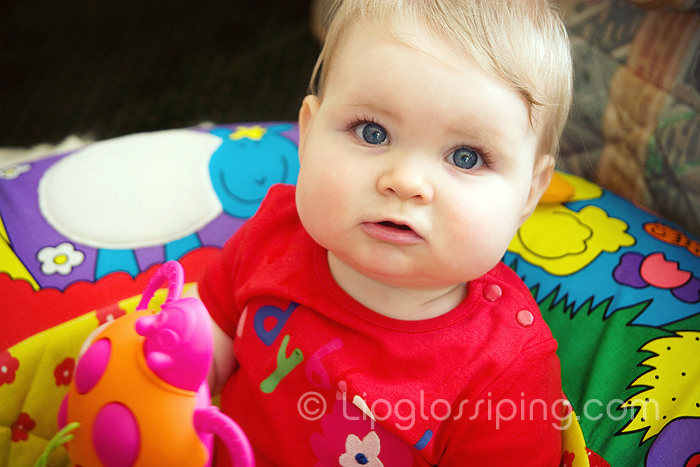 She’s 9 months old on Tuesday… I can’t believe how quickly time has flown! omg, aww indeed. how cute is the little bundle of colours here. I just want to poke/squeeze those pudgy cheeks! Aaaw, your little one is very cute. I’ve said it before, but I’ll say it again. Your little baby is a beauty! Totally distracted by Leila, how cute is she?? Hope both of your colds are clearing up in time for LFW for you! LEILA IS SOOOO CUTE! OH MY GOSH YOU LUCKY SOD! 😀 I hope she gets much much better. I really wish I could go to the fashion week, but I guess I’ll have to wait till I can drive [away from exams and into the world of makeup and hair!] 😛 OH AND BY THE WAY, IT DOES MATTER WHAT YOU WEAR 😛 Ahaha. @LadyGray… and if you say their names quickly enough. Spooky makeup blog twin babies! @liloo – hmmm, not a shoe person, or a handbag person… or a clothes person.. it’ll have to be the lippie! I could always fall on my arse *sexily*. I’m sure it’s possible. @MizzWorthy – Takes after her mum innit? *pinches you* INNIT?! She is absolutely gorgeous! Not long now though until she’ll be running and causing all kinds of bother.